A bill that would allow elected officials to set up trusts to raise money from private sources to cover legal fees is set to be approved by the New York City Council on Thursday. 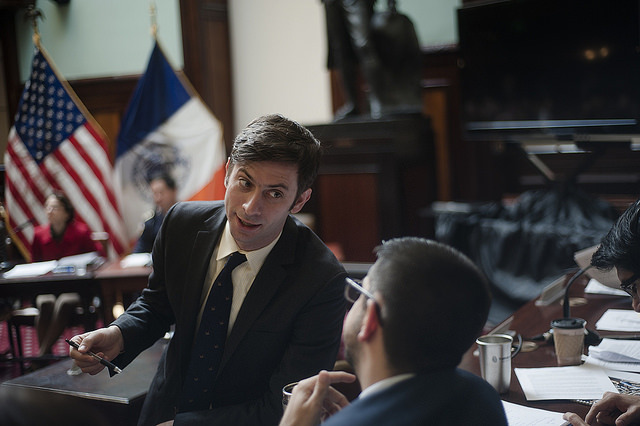 The legislation, sponsored by City Council Member Stephen Levin, would allow city officials to raise as much as $5,000 from individual donors through trusts, to pay for legal fees arising from criminal or civil investigations that are unrelated to their governmental duties, such as those involving campaign activity (legal fees related to government duties can be covered by public funds). The trusts would have to file detailed quarterly reports on fundraising and spending with the city Conflicts of Interest Board (COIB), and would be prohibited from taking donations from lobbyists, corporations, LLCs, and people doing business with the city. The reports will be posted publicly online. Levin’s bill is meant to fill a gap in the city’s legal framework that allows elected officials to use taxpayer funds to cover their defense in investigations arising from their official duties, but not in the case of non-governmental activity. Mayor Bill de Blasio found that out the hard way after facing dual state and federal probes into his fundraising activities through outside nonprofit groups and, in one, related government actions, which eventually led to no charges being filed but left the mayor with hefty legal fees running into the hundreds of thousands, even after he reversed course to utilize public funds to cover the bulk of over $2 million in fees related to the federal inquiry of whether he directed government favors based on campaign donations. The mayor initially sought to use a legal defense fund to cover the costs but the COIB issued an advisory opinion limiting any donations to a mere $50, viewing them as gifts to an elected official which are severely limited by law. The mayor then used public funds to pay for the costs related to his government duties -- about $2.6 million -- but said he could not cover a separate bill that related to his non-governmental activity. De Blasio is not the only elected official who has had significant legal bills to deal with related to their official or non-governmental activity, he and others have pointed out. The legislation is scheduled for a vote at a hearing of the City Council’s Governmental Operations Committee on Thursday morning, in what seems to be a rushed vote -- the bill was introduced on January 9 and the committee held an initial hearing on it last Monday, at which several questions were raised by COIB representatives and Council members. 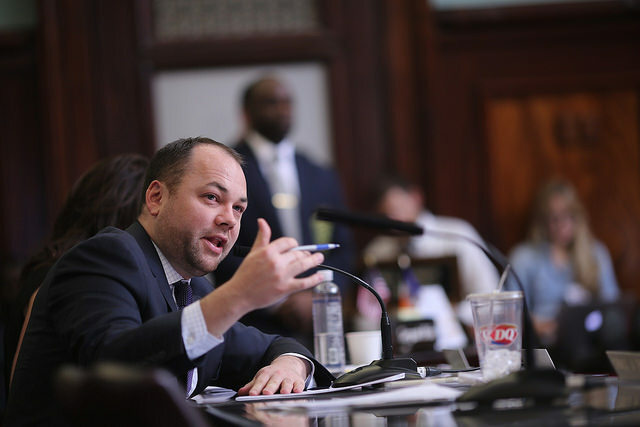 Spokespeople for Levin and for Council Speaker Corey Johnson said the bill is expected to pass through the committee and to be approved at a meeting of the full Council in the afternoon. It is very rare for any legislation at the City Council to move so quickly from introduction to passage. The government reform community is split in its opinion on the legislation. Groups like Common Cause New York and Reinvent Albany have supported the effort to create a framework around legal defense funds, while another reform group, Citizens Union, disagrees with the very concept. In a letter of opposition sent to the Council on Wednesday, Citizens Union argued that the bill “creates the risk or appearance of corruption and undue influence, and will necessitate a complex regulatory scheme to mitigate.” The group urged the Council to, at minimum, tweak the legislation to bring donation limits in line with the lower limits that apply to campaign contributions. The Campaign Finance Board, which monitors campaign fundraising and expenditure in municipal elections, also raised concerns about the bill. Executive Director Amy Loprest noted in her testimony before the governmental operations committee on January 14 that the legislation seems to allow officials to use trusts to pay for fines incurred from campaign finance violations. Officials can already cover those costs from their campaign accounts, which are subject to stricter fundraising limits. Mayor Bill de Blasio owes hundreds of thousands of dollars to lawyers who helped him during legal investigations that ultimately resulted in no criminal charges against the mayor, but left him with bills to pay even after he reversed course and decided to use public funds to cover the portion of his legal expenses related to his government work. The remaining balance, for work related to campaign activity de Blasio was involved with that was the subject of part of the inquiries, has left de Blasio looking for a new way to pay off his debts: a legal defense fund whereby he raises money from donors willing to help him. But, there’s been a key catch: the city does not have a legal framework for allowing public officials to create such accounts, and the advice the mayor got from the city’s Conflict of Interest Board limited him to receiving very small gifts from prospective benefactors. On Monday, January 14, the Council’s Committee on Government Operations held a hearing on a bill proposed by Council Member Stephen Levin, a Brooklyn Democrat, that would allow city officials to establish such trusts for fees incurred during an investigation or trial. The bill sets a donation limit at $5,000 per donor, which is more than double the $2,000 limit for campaign contributions, with no limit on how much an official can raise in such a fund. As written, the bill bans lobbyists, persons doing business with the city, corporations, and LLCs from contributing to legal defense trusts. Additionally, any legal defense trusts would be required to make quarterly reports to the Conflict of Interest Board on their donations, which would then be made public and posted online, in a manner similar to the Campaign Finance Board’s reporting of political donations. No campaign funds could be used for a legal defense trust or vice versa and each trust will be overseen by an independent trustee. Levin said that his bill “would bring transparency and regulation to a system that is in need of improvement.” Under the current law, city officials in civil and some criminal cases are entitled to a legal defense paid for by the city, as long as the cases relate to their public duties. However, offenses unrelated to an official’s public duties (such as political campaigns, issue advocacy, and certain administrative issues) are not paid for by the city. While there have been past instances to raise the issue, the bill and committee hearing were spurred by a March 2017 advisory opinion from the city’s Conflict of Interest Board, which stated that because there was no law specifically addressing the issue, donations to a public official’s legal defense fund are considered gifts under current law and therefore limited to $50 per person. The advisory opinion came after Mayor de Blasio planned to create a legal defense fund to cover fees from state and federal investigations into his fundraising activities. De Blasio, a second-term Democrat, was never mentioned by name during the hearing, but was frequently referred to as a “public official in the headlines,” when the advisory opinion was brought up during testimony provided by representatives of the Conflict of Interest Board. At a press conference on January 8, de Blasio reiterated his assertion that a new legal framework was necessary. “I believe there is a need in a democratic society for this kind of mechanism, a legal defense fund is a very well established idea,” he said. He added the caveat that the bill had not gone through the legislative process, so he didn’t know the final wording. When asked if he would disclose his donors if the bill passed, he replied “absolutely” (it may be required). While de Blasio has been earning the salaries afforded to elected officials for many years, he also owns two houses in Park Slope, Brooklyn, making him fairly wealthy. He has indicated he does not have the means to pay his legal bills, not acknowledging the possibility of leveraging his property, or at least its value. He has pointed to the larger case for legal defense funds that goes beyond his situation, something it appears City Council members and others are in agreement about. De Blasio has claimed that law enforcement investigations are part of being in political office. At the hearing, the bill appeared to have the support of the Council members who spoke, although some had suggestions for improving it. The Conflict of Interest Board, represented at the hearing by its executive director, Carolyn Lisa Miller, and general counsel, Ethan Carrier, also expressed general support. However, Miller said there are some reservations about a section of the proposed bill that would ban the use of a defense fund from paying legal fines, but allows a fund to pay civil and administrative fines, such as Campaign Finance Board fines. Council Member Keith Powers, a Manhattan Democrat who expressed support for the concept of the bill but is undecided about its current form, asked about this section, but it was unclear if the provision would be changed. Miller stated the COIB already does not have enough resources to do its mandated work and would require additional funds to fulfill the requirements of the bill. She estimated that an online reporting portal would cost $40,000 to set up and a few thousand each year afterwards for licensing. The bill requires quarterly reporting for defense funds and each audit would cost between $5,000 and $10,000, according to Miller’s estimate based on information from other city agencies. When asked about the number of defense funds that would be registered, she said she did not know. If the section allowing defense funds to pay campaign finance violation fines were to be included in a final bill, she estimated that as many as 50 defense funds could be established. Without that provision, she said there were only be a few, if any, per year. Many candidates for office wind up incurring some amount of fines from the Campaign Finance Board, often ranging from a few hundred dollars to a few thousand. Council Member Kalman Yeger, a Brooklyn Democrat, said he supports the concept behind the bill, but thinks that the specifics could be improved. He questioned why the Campaign Finance Board would not allow COIB to use its reporting portal or certified auditors, which he said would save taxpayers money. According to Miller, the CFB’s portal is proprietary to that agency and cannot be used by COIB. Near the end of the hearing, Cabrera proposed that the CFB could administer the bill’s requirements instead of the COIB. Both Levin and Treyger were against this proposal, but Yeger reaffirmed that he would like a mandate included in the bill for the CFB and COIB to share resources. While not at the hearing, watchdog group Common Cause supports the bill. 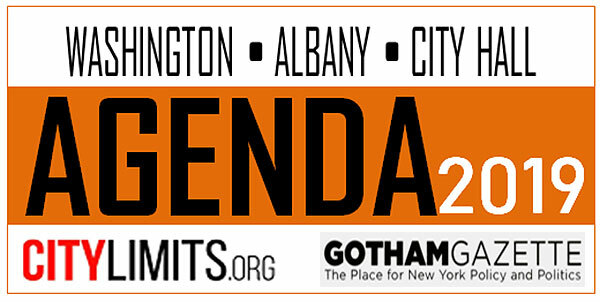 In a July 2017 statement in support of legal defense trusts, Susan Lerner, the executive director of Common Cause/NY, said that “there must and should be a process for public officials to raise funds to pay for legal bills” and “we need a policy in place to give public officials a workable solution and avoid ad hoc improvisation.” Common Cause commissioned a study of legal defense fund laws across the country and made recommendations to cover New York City’s perceived “policy gap.” Levin’s bill includes many of Common Cause’s recommendations. The Council committee hearing on the bill only included a statement from Council Member Levin, its lead sponsor, and the representatives from COIB. The Council now has to decide whether to amend Levin’s bill and if more hearings are required to address the issues raised at the January 14 hearing. The Council will also have to decide to vote on the bill or put it on indefinite hold. If it passes committee, it will go to the full 51-member Council. Meanwhile, it is unclear when exactly Mayor de Blasio’s legal bills are due, the debt has been outstanding for quite some time now. Note: after initially mistaking Council Member Yeger for Treyger, this article has been corrected. It has also been updated to clarify Council Member Powers' stance on the bill. That is why, as moderators at this year’s New York State Supportive Housing Conference, we are proud to champion the city’s efforts to build more supportive housing -- a critical component of the City’s efforts to combat the homelessness crisis. We’re proud that the new city budget recently agreed upon by the Mayor and City Council, which we are members of, increased from 500 to 700 the supportive housing units that will become available in the next fiscal year. There is still much more to do. Supportive housing is permanent affordable housing paired with wrap-around services designed to help people maintain their homes for the long-term. All tenants have a lease, and are provided with individualized on-site care, including case management, job training, and mental health and substance abuse counseling. Supportive housing developments are run by non-profit organizations that typically provide both support services and management. Last year, the City Council General Welfare Committee held a hearing in The Schermerhorn, a supportive housing building that also contains affordable housing units for community members and artists, along with a theater for the public. It is a good example of how these developments create jobs and contribute to the growth and well-being of a neighborhood. Supportive housing’s track record has shown its effectiveness in ending homelessness, and improving neighborhoods, creating much-needed affordable housing and saving taxpayer dollars. Simply put, it is housing for those most in need. Residents have a place to call home in an environment that provides direct case management and access to mental health providers. We know all too well how vital mental health care is to a person’s wellbeing, and is that much more critical for individuals who are unstably housed and have often faced significant trauma. The integrated service model enables people to connect to the programs that are right for them, helping them to lead their best lives. Organizations like the Supportive Housing Network of New York, comprised of more than 200 nonprofit organizations, link the 50,000 units of supportive housing they’ve created with critical services and programs that give New Yorkers a jumpstart on advancing the lives they want to lead through a more holistic approach. Like Robert, who struggled with mental illness and addiction most of his life, living in Madison Square Park for ten years. After a health emergency, Urban Pathways’ outreach team helped him move into a beautiful new apartment in his native Bronx. He’s an active participant in his building and in client advocacy groups, regularly visits with his mother and grandchildren, and is beloved by residents and staff alike. And like Shannon, who has dealt with undiagnosed bipolar disorder and PTSD from a lifetime of sexual assault and domestic abuse. When she became a tenant at Community Access’ Gouverneur Court, things started to change: she fell in love with her current life partner, fellow resident Kenny, and overcame addiction with the support of the staff at Community Access. She now has full time work at the Social Security Administration and recently graduated with a master’s degree. These stories show firsthand that supportive housing works. 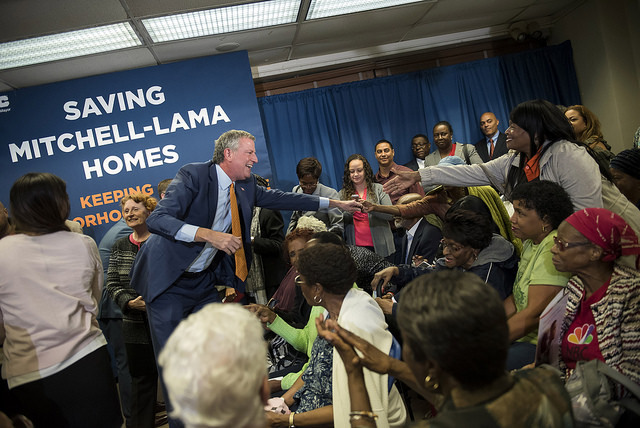 It’s why the Mayor proposed a plan in 2015 to build an additional 15,000 supportive housing apartments over 15 years through the city’s new NYC 15/15 program. We applaud the administration for this plan, yet we also know the need is immediate. We need to do more to bring units online today. 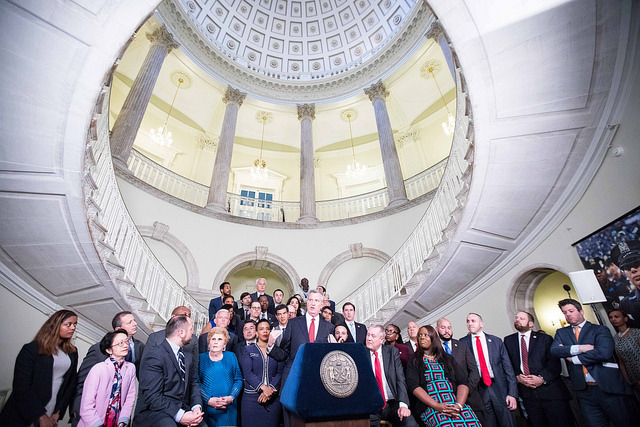 As Chairs of the City Council’s Land Use and General Welfare Committees, we’re working collaboratively with our fellow Council Members to help speed the creation of the Mayor’s promised 15,000 supportive apartments over the next several years so that all New Yorkers will have a place to call home. We need a bold vision to end homelessness. Supportive housing is the key. Stephen Levin represents the 33rd City Council District, including parts of Brooklyn, and Rafael Salamanca, Jr. represents the 17th District, including parts of the South Bronx. On Twitter @StephenLevin33 and @Salamancajr80. The City Council’s Committee on Housing and Buildings on Wednesday heard more than a dozen bills that would enhance tenant protections and combat abuses by landlords. Among those proposals was one that would create a new ombudsman within the Department of Buildings whose responsibility would be to prioritize the welfare of tenants when property owners and builders apply for construction permits. The bill, Intro. 1523, was introduced by Council Member Helen Rosenthal last month and heard for the first time Wednesday. It would create an Office of the Tenant Advocate, charged with approving and monitoring tenant protection and site safety plans submitted to the Department of Buildings for construction work on occupied multiple dwellings. The OTA would receive and redress complaints from tenants and would be required to publish quarterly reports on its work, including data on the number of complaints received, time taken to respond to complaints, and the number of tenant protection and site safety plans reviewed. But her bill received push back from the de Blasio administration as well as the real estate industry, both of which argue that the OTA would be redundant. “While we generally support the bills discussed at yesterday’s hearing, we’re concerned that this particular legislation would duplicate work the Department already performs,” said Joseph Soldevere, a DOB spokesperson, in an email. Soldevere said the department’s experts thoroughly examine tenant-protection and site-safety plans and, along with other agencies like Housing Preservation and Development (HPD), have a “robust system” for responding to tenant complaints. DOB also partners with HPD and law enforcement agencies, Soldevere added, in a joint city-state Tenant Harassment Task Force which has conducted more than 2,000 inspections since 2016. 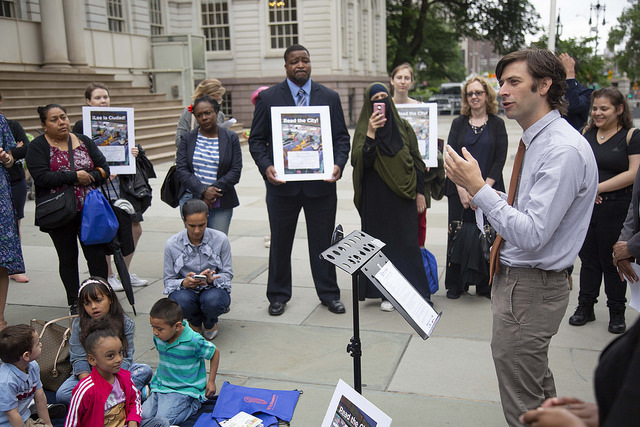 Council Member Stephen Levin, a Brooklyn Democrat, is a co-sponsor on Rosenthal’s bill. He criticized the DOB’s often-delayed response time to complaints, calling them “totally ineffective” and insisting that the raft of proposals, dubbed the “Stand For Tenant Safety” package, was essential. “It’s important that agencies coordinate their actions in working with tenants,” he said. The Real Estate Board of New York, the trade association that represents more than 16,000 members, including developers, property owners, managers and brokers, filed a legislative memo with the City Council committee on Wednesday, stating its outright opposition to the OTA bill and generally to the larger package of proposals. The broader package of bills addresses a number of issues, with proposals including oversight of contractors that work without a permit; added requirements for information in tenant protection plans; a safe construction bill of rights for tenants; a rebuttable presumption of harassment for certain landlord actions; increased civil penalties for harassment and enhanced definitions of acts that constitute harassment; among others. 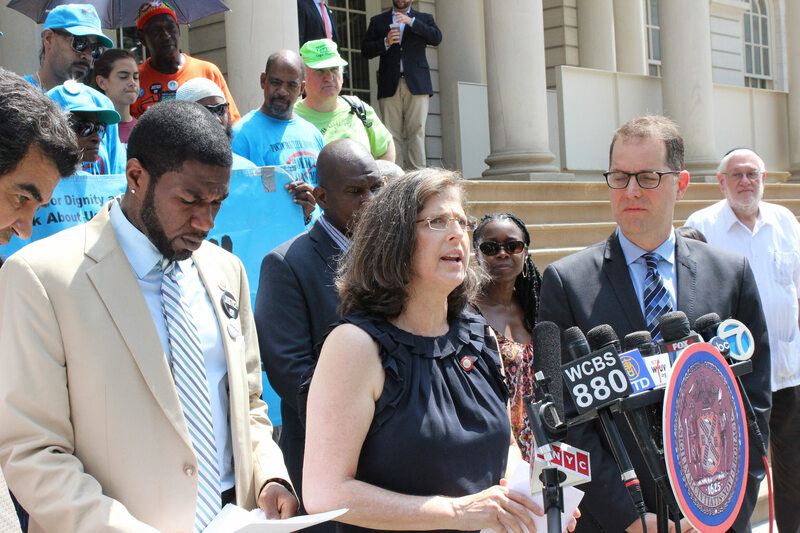 The package is also keeping in line with the City Council and Mayor Bill de Blasio’s increased focus on tenant protections, including the recently agreed upon “Right to Counsel,” which provides free legal representation or advice to tenants facing eviction. The mayor has pointedly cited his anti-eviction and pro-tenant policies as a significant part of his overall agenda to combat the city’s record levels of homelessness and affordable housing crisis. Though HRA provides a wide variety of services -- including job training and emergency food assistance -- the committee’s questioning focused almost exclusively on the city’s homelessness crisis and the lack of progress that has been made by the de Blasio administration. There are currently about 60,000 New Yorkers living in homeless shelters, and Mayor Bill de Blasio recently outlined the goal of reducing the population to about 57,500 over five years. While the mayor has admitted that his administration has not made enough progress reducing homelessness, he argues that the population would be around 70,000 if not for the rent subsidy and anti-eviction measures his team, led by Banks, has implemented. Responding to Levin and committee members, most of whom were late to the hearing, Banks provided a comprehensive rundown of the investments DSS and the de Blasio administration have instituted, such as voucher programs and legal assistance to tenants facing unwarranted eviction. He also discussed the HOME-STAT initiative, which has doubled the number of outreach workers on city streets in order to bring people into shelter. Though the committee acknowledged its support for these measures and conceded that significant investment has been made, they nevertheless stressed their dissatisfaction -- often bordering on outrage -- with the lack of progress, especially considering the concentration of resources targeted at homelessness. Expenditures for HRA and DHS have ballooned under de Blasio, and the mayor is proposing more money for the fiscal year 2018 budget, which is due by July 1. 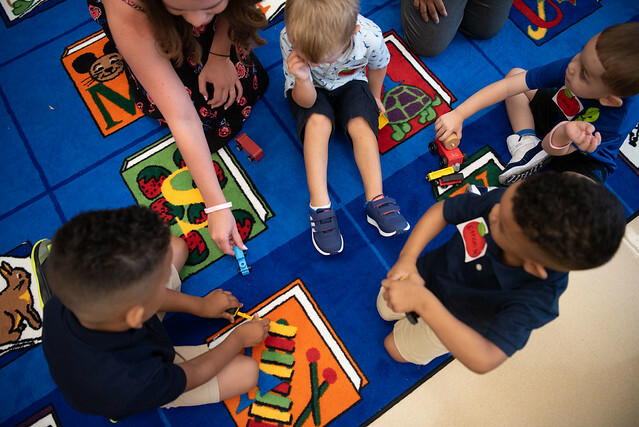 In his $84.67 billion preliminary budget proposal, 18 cents of every dollar goes to social services, the second largest portion behind education. The mayor has allocated $7.5 billion for the Department of Social Services and $772 million for the Department of Homeless Services, though both numbers are likely lower than the adopted budget will show at the end of June. 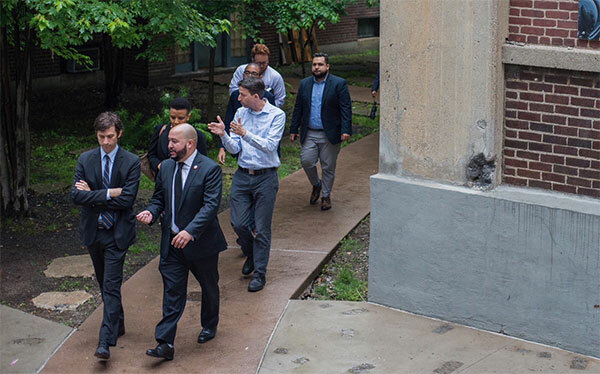 At Monday's hearing, Council Members Barry Grodenchik, Corey Johnson, and Brad Lander were particularly critical of the administration’s efforts. 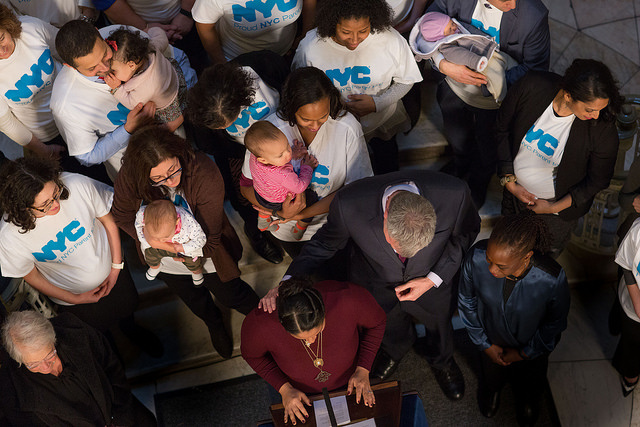 The notion of placing more homeless families into public housing, through NYCHA, is something that some elected officials and advocates have long-called for, but that Banks and de Blasio have said is not the right approach. The mayor has cited the already-long NYCHA wait-lists. “It’s disturbing to walk down the streets everyday and to see homeless people on nearly every block...even after all these efforts at homelessness prevention, it still feels like we are not being successful,” added Council Member Johnson, who represents Chelsea and Greenwich Village. --The Supplemental Nutrition Assistance Program (SNAP), which helps feed 1.7 million New Yorkers, including more than 650,000 children, added 8,371 participants in the last year. Asked about the future of SNAP in New York City, given the uncertain prospects for federal funding under the Trump administration, Banks said that he and the mayor would be working with Senators Chuck Schumer and Kirsten Gillibrand to retain SNAP funding for New York City recipients. --According to Banks’ testimony, HRA provided rental assistance to 58,100 households in 2016 at a cost of $214 million. Asked about the widespread problem of landlords refusing to honor rental assistance programs and vouchers, Banks provided a phone number that residents can now call if they experience such refusal. Banks said HRA is determined to identify non-compliant landlords and compile a database of these individuals. --Banks’ testimony also explained that HRA has eliminated the Work Experience Programs (WEP) in favor of Job Training Program slots at NYPD, Parks Department, Department of Sanitation, and Department of Citywide Administrative Services (DCAS). The programs will serve up to 210 cash assistance participants annually. --The HIV/AIDS Services Administration (HASA) accepted 3,444 new clients from August 2016 through January 2017, which is 1,410 more than the same period from the previous year. This was result of an HIV expansion program that allowed “all financially-eligible New York City residents with HIV to seek and obtain HASA services.” Applicants previously had to have developed AIDS or be “symptomatic” to be eligible. Council Member Johnson, who chairs the health committee, spoke about the success of HASA as a key achievement. --Banks’ testimony also announced a DHS plan to add 10,000 affordable apartments specifically for seniors, veterans, and New Yorkers earning less than $40,000 per household. DHS also has plans to institute an Elder Rental Assistance program, to be funded through the mayor’s “mansion tax,” to help more than 25,000 seniors with monthly rental assistance of up to $1,300. The mansion tax is unlikely to be approved in Albany, though. --In 2016, DHS placed 3,153 homeless veterans in permanent housing. --30% of families with children in a DHS shelter have a history of domestic violence. The Fiscal Year 2017 budget included $217 million for DHS security purposes. --Banks also referenced the 24% drop in evictions citywide since the institution of free legal assistance programs for many New Yorkers facing eviction. More than 40,000 residents avoided eviction in 2015 and 2016. The mayor and the City Council recently agreed to expand such assistance further. --Banks provided figures to demonstrate why the city has struggled to contain its homelessness problem. Between 2000 and 2014, Banks testified, median rent has increased 19%, while household income decreased by 6.3% over the same period. --360,000 New Yorkers now spend more than 50% of their income on rent and utilities. Another 140,000 spend more than 30%. --All in all, homelessness has increased by 115% over the past two decades. In 1994, 23,868 New Yorkers were homeless, by 2014, when Mayor de Blasio took office, that number was 51,470. It is now around 60,000. Banks' testimony was followed by the General Welfare Committee's examination of the Administration for Children's Services.